How do you keep track of your goals? I have an idea I came up with several years ago. It came about when I set my goals and I forgot about several goals because I had written them down and then forgot to refer back to them due to a busy job I had at the time. Life just had gotten so busy and I was not working from home every day so I forgot about them. Well, I didn’t want that to happen anymore! I came up with a Goals Board solution! I love it. You can do it in any size large or small. You can write them on the glass or you can print them out. It is up to you. I choose to print them in an 8 x 10 frame and I write them on a larger 30 x 30 picture putting the goals I’m working on that month. I just scouted my local thrift stores and the local Goodwill and found a lot of really nice picture frames that I was able to update and use in my kitchen and office as my Goals Boards. It is so simple to do and will only take a few minutes to do. If you want to get creative with the frame you can and paint and decorate it any way you choose. I had found a beautiful old wooden frame so I just left it the way it was and I just use Old English on it every couple of weeks. You don’t have to use it as a goals board you can use it for your chore chart, or for an information center for your family. I actually have used mine for a message board as well. I have since created a message board out of a pretty frame. To hang right by the door so everyone can see it. It has it’s own dry erase marker so they don’t have to hunt for a marker. Cut the piece of paper or poster to fit inside your frame. I change my paper with the seasons. sometimes I find wrapping paper I like and use that. Hang your goals picture frame and you’re done. Thats all there is to it. It is an easy to do project that will give you somewhere to post the important things you don’t want to forget or the doctor’s appointment you can’t miss. When you create your Goals Frame or Message Frame be sure to post a photo in the comments I would love to see how you decorated your frame. Here is my finished Family Board and two of my Goals boards in my study. We all love it and have somewhere to put important notes, chores, and things we need to remember. 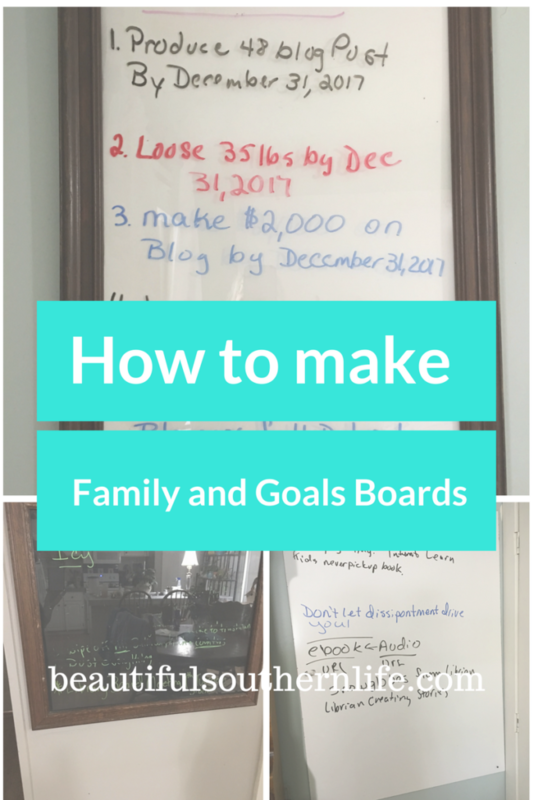 If you make a family or goal board be sure to share it with me I would love to share it on the blog with others and I will share it with my readers on my Facebook page. 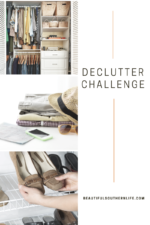 A Study on Clutter: Is Clutter Making us Sick? 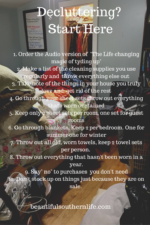 Previous Post: « Summer Cleaning Series: What is Green Cleaning and Why Should I care? I really like this idea. In fact, I like it so much I’m including it in a roundup post I’m publishing tomorrow. 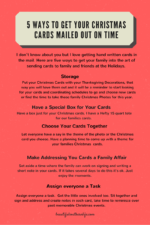 Great tips and ideas to keep you on track.